The Ségou Village Connection “cruise for Internet literacy” on the river Niger, in Mali, in partnership with the Loire-Niger UNESCO heritage project [fr], has now completed a two-week training tour of schools on the banks of the river, with very positive results. Boukary shares highlights of his groundbreaking cruise. Rising Voices: How many villages and schools did you visit and train during this educational cruise? 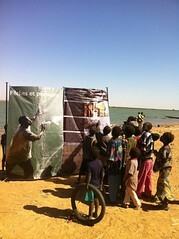 Boukary Konaté: The UNESCO barge stopped in Sékoro, Ségou, Markala, Mopti, Kokribozo, Macina, Diafarabé, Ouro-Modi and Mopti to present their photo exhibition on the Niger cultural heritage. I gave introduction workshops to the Internet in as many school along the way. In Mali, 40 to 60 pupils per class is average. On occasions, the whole school attended. We estimate the number of persons who have been introduced to the internet and basic search on the Web at around 800, from primary school kids to adult students. RV: What did you teach them? BK: Most villages along the Niger live from fishing or grow rice paddies, there is no road, no electricity or TV, they are isolated but even the poorest shepherd has a mobile phone now. A lot of people had heard about the Internet, but did not know what it was. I am a teacher by profession, I emphasized that is was a learning tool. We did searches on Google on whatever they wished, and every time, they found the answers to their questions. I also introduced them to Skype, information websites such as Maliweb, Yahoo News, Global Voices, the Ministry of education website, Twitter and Facebook. RV: Tell us about a training session that struck you. 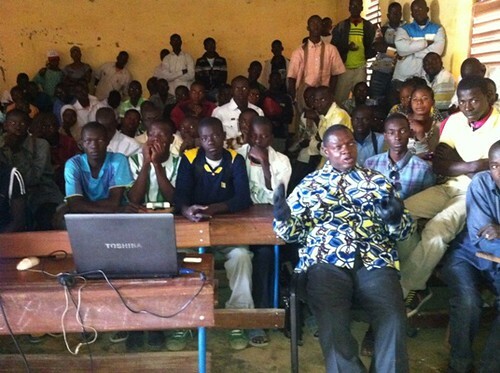 In Macina, I lectured in a vocational school for farmers and cattle raisers (IFP). They searched Google on volcanoes, on the chemistry of soil, water, but what struck the students most was to discover that their village was on the Internet! And not only that: that there was another Macina, in Serbia! There was quite a debate with their teacher on books versus the Internet, but school books are rare, and we agreed that the Internet could become one day the school library. RV: how did the local authorities react? BK: Very well. There is often at first a prejudice, that “internet is for the rich”. In Fulana villages, I was told that “Once a man has enough to eat and drink, he needs to have information and share information, to know people and to be known”. The villages would like to have a permanent access to the Web. RV: what have your learnt yourself from this tour? BK: Being a Bambara, I have discovered ethnic groups and languages I knew nothing about, the Fulani and Bozo. I have discovered my country! I was struck by how welcoming the Fulani are, by the beauty of their villages and architecture, up North. I am now comfortable sailing on water, something I was afraid of. And I will always cherish the beauty of sunsets and dawns on the river Niger. RV: How do you see the future of the Ségou Village Connection project? BK: We hope that UNESCO will organize another tour, that the Ministry of Education in Mali will take notice and mainstream such initiatives. 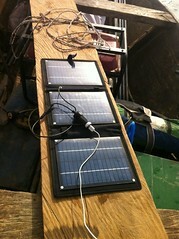 All you need is second hand laptops, a solar cell, a transformer, and minutes of mobile phone credit to access Internet via mobile network, which is reliable in Mali even in remote places. The other solution is to crowdsource good will, not as a beggar, but as a person convinced that what he/she is trying to do is important. 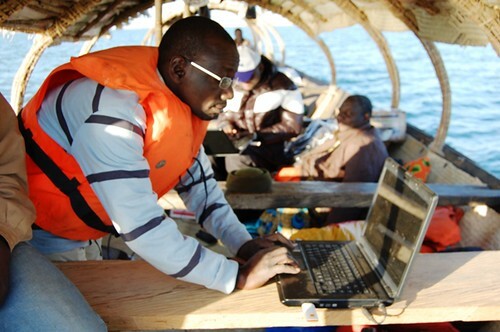 You can also visit Boukary Konaté's photo gallery documenting the “Internet cruise” on the river Niger. Je souhaite ardemment la continuité de cette activité. Les villageois espèrent voir Internet mobile installé chez eux un jour! There are more than 5000 indigenous hill youths who never have the chance to get access to the internet in Tipaimukh areas of Churachandpur district in North East India! I am trying to reach out to these people, especially youths and train them on how to use the internet with the heldp of Rising Voice. Will Rising Voice be able to help these youths to raise their voices like others around the World? I hope rising Voice widen ist impact and make itself heard to North East India – hill people.